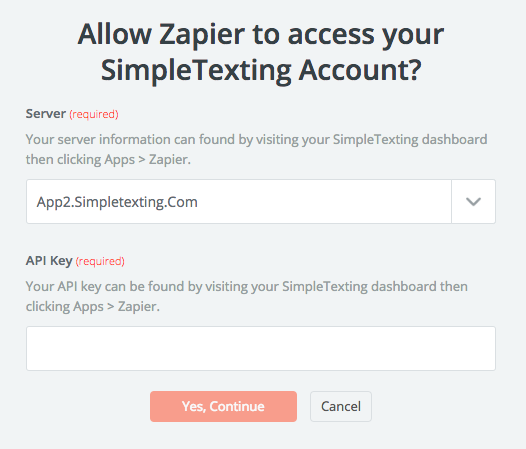 Our Zapier integration allows you to pass information between SimpleTexting and 1,000+ other apps. Follow these steps to get started. With SimpleTexting and Zapier, you can get rid of busy work, free up time, and feel like a magical marketing wizard. Zapier lets you automate processes called Zaps, without having to touch a single piece of code. Let's build a Zap together, shall we? In the example below, we'll create a Zap that adds new Constant Contact subscribers to your SimpleTexting list. Click on Connected Accounts and search for SimpleTexting. You'll be presented with a prompt asking for your Server URL and API key—this will make sense in the next step. Go to the Apps section and scroll down until you find Zapier. Copy and paste the Server URL and API key into Zapier. Click Yes, Continue. You did it! Your SimpleTexting and Zapier accounts are now connected. Time for the fun part. Click Make a Zap at the top right-hand corner of your Zapier account. This is the app that will launch your process. We'll choose Constant Contact, but you can choose any app from the drop-down menu. A trigger is what tells your Zap to run. In this case, we'll select New Contact. Click Continue. Click Connect an Account. Follow the instructions on the new window that opens. For this example, we just have to login to Constant Contact and click Allow. Boom! Your Constant Contact and Zapier accounts are now connected. Go to the next screen to pull in some sample data and click Continue. What do you want your Zap to do when a new contact is added to your Constant Contact list? For the example, we'll choose Add Contact. This is where you tie everything together. Choose the list you want to add your new contacts to. Show Zapier what information it should pass between the Contact Contact and SimpleTexting. On the next screen, you'll be given the option to test your Zap. It's always a good idea to make sure everything's working as intended before turning your new Zap on. 13. Turn your Zap on! Once you've successfully tested your Zap, turn it on! Now, whenever a new contact is created in Constant Contact, they'll be added to SimpleTexting. P.S. We've created several Zapier templates that let you skip most of the steps above. Go to Apps > Zapier in your SimpleTexting account to view them.